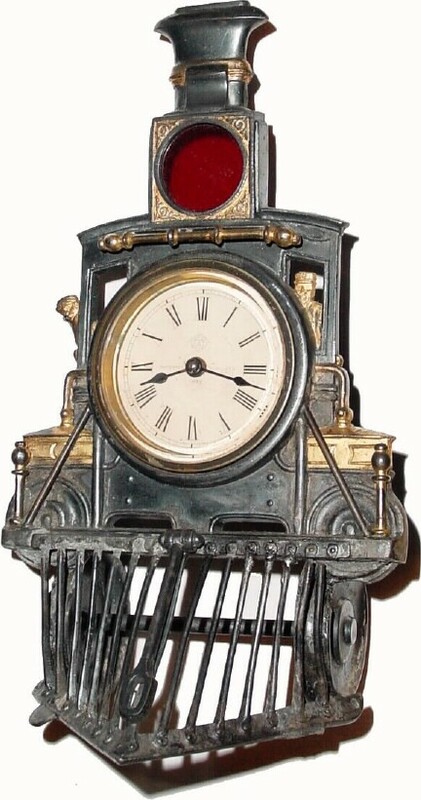 C.1886, Ansonia Clock Co., "Novelty No. 44" 30-hour timepiece in fair to good condition, with restoration. Three of the spokes on the cow catcher have been re-soldered. There has been a solder repair where the wheels attach to the body (on both sides). The paper dial is very clean and the bevel glass is perfect. The faceted glass in the headlight has been replaced with flat glass (red) Still looks decent; worth $1000 if perfect. Height 73/4"